Welcome to South Village Estates! This unique 55 and over unit is one of 4 units located in a neighborhood setting of single family homes on a cul de sac street. 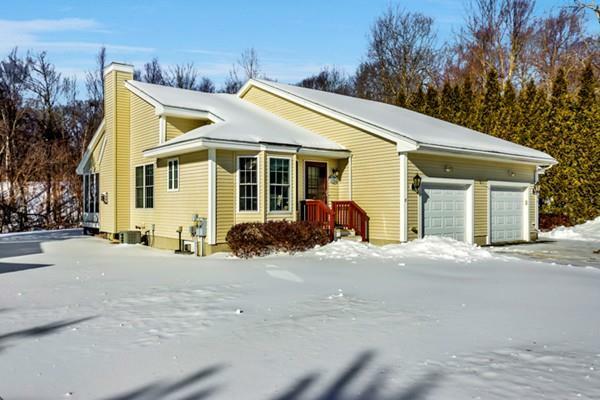 Lovingly maintained and in move-in condition, the open floor plan boasts cathedral ceilings, recessed lights, electric fireplace for those cold wintery nights and hardwood floors. Cabinet packed kitchen with glass front doors, crown molding and a wide pass thru to the formal dining room - great for entertaining! Breakfast area with bay window overlooks the front yard. Spacious master bedroom with cathedral ceiling, ceiling fan and hardwood floors. Relax in the bright and sunny 3 season sunroom overlooking the woods. No need to look any further. You will fall in love!